''ሜጫዊ'' አስተሳሰብ የተጠናወታቸው ሽብርተኞች በሩስያ ያደረሱት የሽብር ጥቃት መወገዝ አለበት። ''MECHA'' minded Terrorists attack on Russia must be condemned. Russia Bus Bomb explosion - Second bomb blast hits Volgograd.
'' ሆድ ያባውን ንግግር ያወጣዋል''- የጀዋር መሐመድ እና መሰሎቹ ፅንፈኛ 'ሜጫዊ' አስተሳሰብ አላማው ህዝብን ማፋጀት ነው! 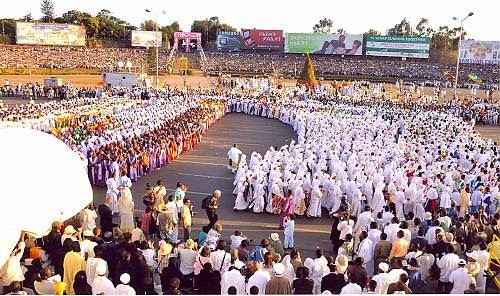 አቶ ኃይለማርያም ደሳለኝ ከሁለት ሳምንት በፊት በሱዳን ጉብኝት ማድረጋቸው ይታወቃል።በእዚህ ጉብኝት ላይ አቶ ኃይለማርያም ''እጅግ ለም የሆነ የኢትዮጵያ መሬት ለሱዳን ለመስጠት ተስማምተዋል አሁን የቀረው ችካል ማስቀመጥ ነው'' የሚል ዜና በኢሳት ሲዘገብ ቀናት ነጉደዋል።ትናንት ታህሳስ 16/2006 ኢሳት በአለም አቀፍ ራድዮ ስርጭቱ ላይ የኢትዮጵያ የድንበር ጉዳይ የሚከታተሉ 'የኢትዮጵያ ድንበር ኮሚቴ' የተሰኘ ኮሚቴ አባላትን በቃለ መጠይቅ አቅርቦ ነበር።እንደ ኮሚቴው ገለፃ ከሆነ አሁን ''የኢትዮጵያ መንግስት ለሱዳን ለመስጠት መስማማቱ የሚነገረው መሬት ከቀድሞ ጀምሮ በኢትዮጵያ ይዞታ ላይ ያለ አሁንም ገበሬዎች የሚገኙበት እና ባዶው ቦታን ጨምሮ በትንሹ ካለምንም ማጋነን 15 ሚልዮን ሕዝብ አስፍሮ መመገብ የሚችል ቦታ ነው።15 ሚልዮን ልብ በሉ! 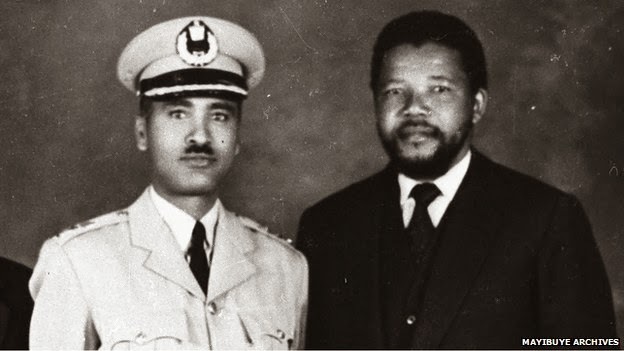 In 1962 Former President Nelson Mandela secretly travelled to Ethiopia for military political and spiritual training under the name of David Motsamai. Haile Selassie's Ethiopian army, on the orders of Haile Selassie himself first trained and armed Nelson Mandela in his struggle against apartheid South Africa. On the personal orders of his Majesty, the Ethiopian Colonel in charge of Mandela's military training gave him a gun with which he was to bring down the ignoble and unhappy apartheid regime still thriving at that time in South Africa. Mandela went back to South Africa to continue his struggle. The rest is history. One of the things that Madiba recently learned is that while he was in Ethiopia , the aparheid government knew where he was and had paid his menders to kill him.We are joined now by Captain Guta Dinka who not only looked after Madiba while he was in Ethiopia but was ordered to kill Madiba. He is with Prof Mamo Muchie who will do the translation for us. ጥያቄ 2 . 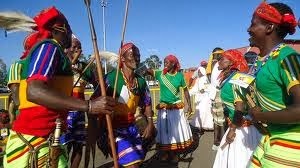 ቅዱስ ጳውሎስ ሀገራችን በሰማይ ነው ስላለ እኛ ክርስቲያኖች በምድራዊት ሀገራችን ላይ እንዴት እንስራ? ጥያቄ 4 ፡ ፖለቲካ ሀጢአት ነው ወይ? - ይህ ብቻ አይደለም ከምንገምተው በላይ ኢህአዲግ/ወያኔ በሀገር ጥላቻ ባህር ውስጥ እየዳከረ መሆኑን ለመረዳት የዛሬውን ቀን የአንድ የመኪና አደጋ ዜና ያክል ቦታ ሳይሰጠው ማለፉ ብቻ ሳይሆን ኢትዮጵያን የወከሉ ባለስልጣናት ዛሬ በነፃነት በአዲስ አበባ እንዲፏልሉ ያደረጋቸው አፄ ምኒልክ የመሩትን የአድዋ ድል እረስተው አንዳች ትኩረት እንዳይሰጠው አድርገዋል።ምናልባት ባለስልጣናቱ ጊዜ ላይኖራቸው ይቻላል ምክንያት ዛሬ ጣልያን ኤምባሲ የራት ግብዣ ይኖርባቸው ይሆናላ! ግን ማስታወሻዬን ከመደምደሜ በፊት አንድ ጥያቄ ልጠይቅ ኢህአዲግ/ወያኔ የእዚህን ያክል ተራ ቂም፣ዘረኝነት፣ሸር እና ተንኮል አናቱ ላይ እየጨፈሩበት እንዴት ብሎ ነው ኢትዮጵያን ያክል ሀገር እና ሕዝብ መምራት ይችላል? ….In July 1962, Col Fekadu Wakene taught South African political activist Nelson Mandela the tricks of guerrilla warfare - including how to plant explosives before slipping quietly away into the night. Mr Mandela was in Ethiopia, learning how to be the commander-in-chief of Umkhonto we Sizwe - the armed wing of the African National Congress (ANC). The group had announced its arrival at the end of 1961 by blowing-up electricity pylons in various places in South Africa. Mr Mandela was in Ethiopia at the invitation of the emperor, an ardent supporter of Africa's decolonisation and African unity. 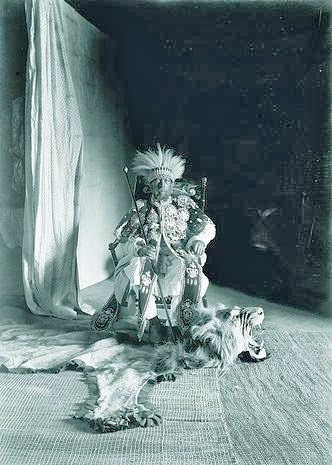 At the time, Ethiopia had one of the strongest armed forces on the continent. Its troops were part of the UN peacekeeping operation during the Congo crisis in 1960 and a decade earlier Ethiopian soldiers had fought in the Korean war. 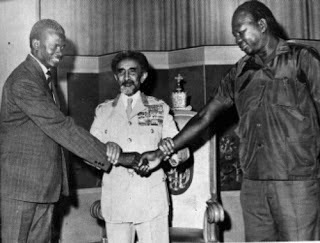 And the emperor had invited many other African liberation struggle fighters to be trained on Ethiopian soil…. የአባቶቻችን አምላክ ወዴት ነህ? ኢትዮጵያን ተመልከት! RIP NELSON MANDELA WE WILL NEVER FORGET YOU. ሰበር ዜና - የተባበሩት መንግሥታት የትምህርት የሳይንስ እና የባህል ኮሚሽን(UNESCO) በኢትዮጵያ የሚከበረውን የመስቀል ደመራ በዓል ዓለም ዓቀፍ እንክብካቤ እና ጥበቃ እንዲደረግለት በዓለም ቅርስነት ዛሬ መዘገበ!! 3/ የቴሌቭዥን ፕሮግራሞች አንዱ የአንዱን እንዳይቀላቅል የሚቀርቡትን ዘፈኖችን ብንመለከት በአማርኛው ላይ የኦሮምኛ እንዳይቀርብ፣በትግርኛው ላይ የአማርኛው እንዳይቀርብ ወዘተ ሆኗል።ይህም ቀድሞ አማርኛ ፕሮግራም ላይ ኦሮምኛው፣ትግርኛው ይቀርብ ስለነበር ሕዝብ እርስ በርሱ አንዱ የአንዱን ባህል የማወቅ ዕድል ነበረው። የእነ ኪሮስን፣አሊብራን የመሰሉ ከያንያን ዝናን ያተረፉት አንድ ለእናቱ በነበረው ቲቪ ህዝቡ እየተመለከተ ነው እንጂ የትኛው ኤፍ ኤም ነው ያስተዋወቀው? ለኢትዮጵያ ብሔር ብሔረሰቦች ብዙ ሺህ ብር እያወጣ ምግብ የሚበላ መንግስት ነው ጥሩ አደረገ የሚባለው ወይንስ ገንዘብ መድቦ የብሔር ብሄርሰቦች ኢንስቲትዩት የመሰረተ? 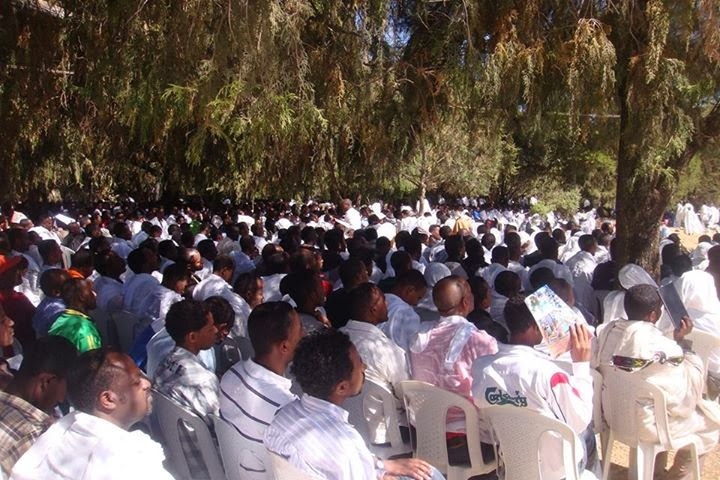 በእየ ዓመቱ የብሔር ብሄርሰቦች ቀን ተብሎ የሚባክነው ብር ስንት ሥራ ለብሄር ብሄርሰቦቻችን በሰራ ነበር። ኢህአዲግ በእውቀት ላይ የተመሰረተ ሥራ እየሰራ ላለመሆኑ አይነተኛ ማስረጃ ይህም ነው። እነሆ ዘንድሮም ጅጅጋ ላይ እንደጉድ ይዘፈናል። ያ የብሔር ብሔረሰቦች ኢንስቲትዩትን ያያችሁ? አሁን አለ? The presidents of Burundi, Kenya, Rwanda, Tanzania and Uganda met Saturday in the Ugandan capital, Kampala, to sign a protocol for the creation of a monetary union to be established in 10 years. This will be a major change and breakthrough for international trade and tourism alike. Progress has been slowed, however, due to concerns of the member countries about the impact of the bloc's decisions on their individual economies. 1.THE EAST AFRICAN COMMUNITY HEADS OF STATE, THEIR EXCELLENCIES PRESIDENT UHURU KENYATTA OF THE REPUBLIC OF KENYA, PRESIDENT JAKAYA MRISHO KIKWETE OF THE UNITED REPUBLIC OF TANZANIA, PRESIDENT YOWERI KAGUTA MUSEVENI OF THE REPUBLIC OF UGANDA, PRESIDENT PIERRE NKURUNZIZA OF THE REPUBLIC OF BURUNDI AND PRESIDENT PAUL KAGAME OF THE REPUBLIC OF RWANDA HELD THE 15TH ORDINARY SUMMIT OF THE EAST AFRICAN COMMUNITY HEADS OF STATE AT THE SPEKE RESORT AND CONFERENCE CENTRE IN KAMPALA, UGANDA ON 30TH NOVEMBER 2013. THE HEADS OF STATE AND GOVERNMENT MET IN A WARM AND CORDIAL ATMOSPHERE. CHAIRPERSON AND THE UNITED REPUBLIC OF TANZANIA TOOK OVER FROM THE REPUBLIC OF BURUNDI AS THE RAPPORTEUR. THE INCOMING CHAIRPERSON EXPRESSED HIS GRATITUDE TO THE OUTGOING CHAIRPERSON FOR HIS STEWARDSHIP OF THE INTEGRATION PROCESS DURING THE LAST ONE YEAR. 3. THE SUMMIT EXPRESSED ITS SOLIDARITY WITH THE PEOPLE OF THE REPUBLIC OF KENYA FOLLOWING THE BARBARIC ATTACK BY THE AL- SHABAAB TERRORISTS ON WESTGATE MALL, NAIROBI AS A RESULT OF WHICH PEOPLE LOST THEIR LIVES AND PROPERTY DESTROYED, AND BUSINESS DISRUPTED. THE SUMMIT REITERATED ITS COMMITMENT TO THE COLLECTIVE SAFEGUARD OF THE PEACE AND SECURITY FOR THE PEOPLE OF EAST AFRICA. THE SUMMIT ALSO EXPRESSED ITS SYMP ATHY WITH THE PEOPLE OF THE REPUBLIC OF KENY A FOLLOWING THE DISASTROUS FIRE AT THE JOMO KENYATTA INTERNATIONAL AIRPORT AND DIRECTED TO ESTABLISH RELIABLE MECHANISMS FOR DISASTER RESPONSE AND RISK MANAGEMENT FOR THE EAC REGION. 4. THE SUMMIT RECEIVED THE ANNUAL REPORT OF THE COUNCIL OF MINISTERS COVERING THE PERIOD NOVEMBER 2012 – NOVEMBER 2013 AND NOTED THE STEADY PROGRESS MADE IN THE COMMUNITY IN PARTICULAR ON PROGRESS ON REMOVAL OF NON-TARIFF BARRIERS. THE SUMMIT COMMENDED THE COUNCIL FOR THE PROGRESS MADE IN DIFFERENT PROGRAMMES OF THE COMMUNITY. a) DIRECTED THE SECRETARY GENERAL IN CONSULTATION WITH THE RELEVANT HEADS OF STATE TO REPORT REGULARLY ON THE IMPLEMENTATION OF DECISIONS INCLUDING NON-COMPLIANCE AND DECIDED THAT THE STATUS OF IMPLEMENTATION REMAINS A STANDING ITEM ON THE AGENDA OF THE SUMMIT. c) DIRECTED THE SECRETARIAT TO PREPARE A COMPREHENSIVE LIST ON NON IMPLEMENTATION OF ALL DECISIONS FOR CONSIDERATION AT THE 12TH EXTRAORDINARY SUMMIT IN APRIL 2014.
d)DIRECTED THE COUNCIL TO PRESENT A REPORT ON ALTERNATIVE FINANCING MECHANISM INCLUDING THE OPTION OF 1% OF IMPORTS FROM OUTSIDE THE EAST AFRICAN COMMUNITY IN PRINCIPLE OF FINANCIAL SOLIDARITY AND EQUITY AND REPORT TO THE SUMMIT AT ITS 12TH EXTRA-ORDINARY MEETING IN APRIL 2014.
e) DIRECTED THE COUNCIL TO SUBMIT PROGRESS REPORTS IN IMPLEMENTATION OF MAJOR DECISIONS AND DIRECTIVES OF THE COUNCIL AND THE SUMMIT EVERY SIX MONTHS. 7. 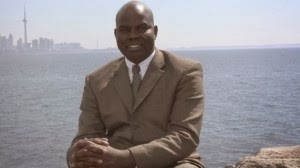 THE SUMMIT APPOINTED DR. EMMANUEL UGIRASHEBUJA FROM THE REPUBLIC OF RWANDA JUDGE OF THE EAST AFRICAN COURT OF JUSTICE (APPELLATE DIVISION) TO REPLACE HON. LADY JUSTICE EMILY RUSERA KAYITESI WHO RESIGNED. THIS APPOINTMENT TAKES EFFECT FROM 1ST DECEMBER 2013. 8. THE SUMMIT APPOINTED HON. LADY JUSTICE MONICA MUGENYI FROM THE REPUBLIC OF UGANDA JUDGE OF THE EAST AFRICAN COURT OF JUSTICE (FIRST INSTANCE DIVISION) TO REPLACE HON.LADY JUSTICE MARY STELLA ARACH AMOKO, DEPUTY PRINCIPAL JUDGE WHO IS RETIRING. THIS APPOINTMENT TAKES EFFECT FROM 1ST DECEMBER 2013. 9. THE SUMMIT DESIGNATED HON. MR. JUSTICE ISAAC LENAOLA AS DEPUTY PRINCIPAL JUDGE TO REPLACE HON. LADY JUSTICE MARY STELLA ARACH AMOKO. THIS DESIGNATION TAKES EFFECT FROM 1ST DECEMBER 2013. 10.THE SUMMIT RECEIVED THE REPORT ON THE ATTAINMENT OF THE SINGLE CUSTOMS TERRITORY. THE SUMMIT NOTED THAT THE FRAMEWORK FOR THE OPERATIONALISATION OF THE SINGLE CUSTOMS TERRITORY HAD BEEN FINALISED AND ADOPTED BY THE COUNCIL. THE SUMMIT DIRECTED THAT THE SINGLE CUSTOMS TERRITORY COMMENCES ON 1ST JANUARY 2014 AND THAT ALL OPERATIONAL REQUIREMENTS BE FINALISED BY JUNE 2014. 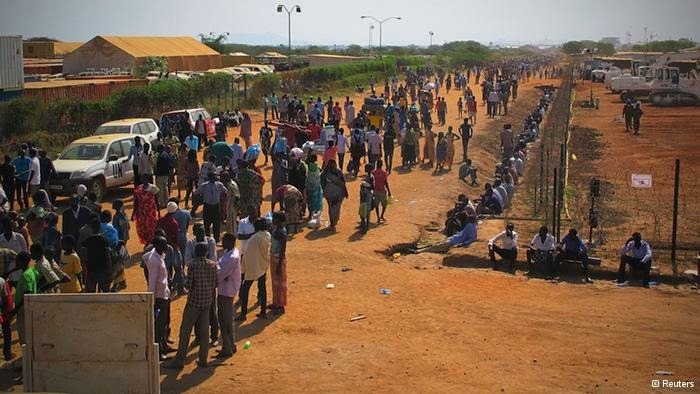 SUDAN INTO THE EAST AFRICAN COMMUNITY. THE SUMMIT OBSERVED THAT THE COUNCIL OF MINISTERS HAD ESTABLISHED A HIGH LEVEL NEGOTIATION TEAM TO CONDUCT THE NEGOTIATIONS AND ENABLE THE SUMMIT MAKE A DECISION ON THE MATTER AT THE 12TH EXTRA- ORDINARY SUMMIT IN APRIL 2014. 12.THE SUMMIT RECEIVED THE PROGRESS REPORT ON THE VERIFICATION OF THE APPLICATION OF THE REPUBLIC OF SOMALIA TO JOIN THE EAST AFRICAN COMMUNITY. THE SUMMIT NOTED THAT THE TERMS OF REFERENCE FOR THE VERIFICATION PROCESS HAD BEEN DEVELOPED AND A VERIFICATION COMMITTEE PUT IN PLACE. THE SUMMIT DIRECTED THE COUNCIL OF MINISTERS TO SUBMIT PROGRESS REPORT ON THE VERIFICATION EXERCISE AT THE 16TH ORDINARY SUMMIT IN NOVEMBER 2014. 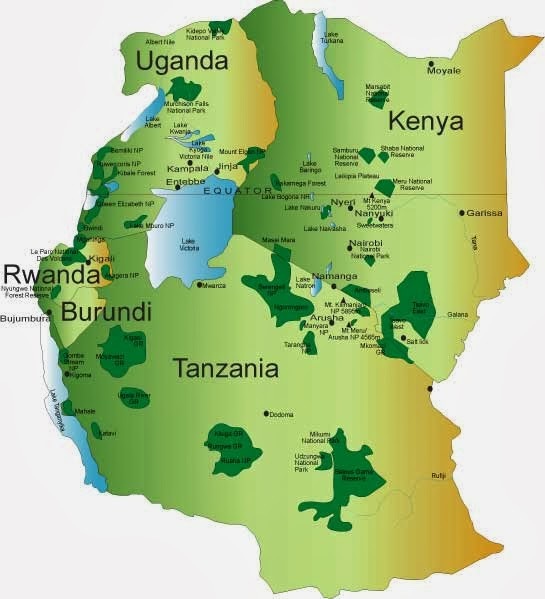 13.THE SUMMIT RECEIVED THE PROGRESS REPORT ON THE ROADMAP FOR THE ESTABLISHMENT OF THE EAST AFRICAN FEDERATION. THE SUMMIT NOTED THAT THE REVISED MODEL STRUCTURE, ROAD MAP AND ACTION PLAN WILL BE CONSIDERED BY THE COUNCIL OF MINISTERS AND SUBMITTED TO THE 12TH EXTRA-ORDINARY SUMMIT MEETING IN APRIL 2014.
e) THE COUNCIL OF MINISTERS APPRISES THE SUMMIT ON THE PROGRESS MADE ON IMPLEMENTATION OF THE ROADMAP TO SINGLE CURRENCY AT EVERY ORDINARY SUMMIT. 15.THE SUMMIT NOTED THAT THE SECTORAL COUNCIL ON FINANCE AND ECONOMIC AFFAIRS WILL BE RESPONSIBLE FOR THE IMPLEMENTATION OF THE MONETARY UNION PROTOCOL. COVER TRADE AND INVESTMENT AS WELL AS MATTERS ASSOCIATED WITH THE EAST AFRICAN MONETARY UNION. ON HUMAN RIGHTS MATTERS AS WELL AS CRIMES AGAINST HUMANITY, THE SUMMIT DIRECTED THE COUNCIL OF MINISTERS TO WORK WITH THE AFRICAN UNION ON THIS MATTER. 17.THE SUMMIT DIRECTED THAT THE INTERNATIONALIZED NEW GENERATION EAST AFRICAN PASSPORT BE LAUNCHED BY NOVEMBER 2015. 18.THE SUMMIT DISCUSSED THE PREVAILING SECURITY SITUATION AND THE NEED FOR CONCERTED EFFORTS TOWARDS COMBATING TERRORISM AND NEGATIVE FORCES IN THE REGION AND REAFFIRMED ITS COMMITMENT TO THE PEACE AND SECURITY IN THE REGION. 19.THE SUMMIT NOTED WITH CONCERN THE RECENT POLITICAL AND SECURITY DEVELOPMENTS IN SOMALIA AND URGED ALL PARTIES TO EMBRACE DIALOGUE AND CREATE AN ENVIRONMENT CONDUCIVE FOR THE IMPLEMENTATION OF SOMALIA’S VISION 2016 AND FACILITATE THE ELECTIONS BY 2016. 20.THE SUMMIT TOOK NOTE OF THE UN SECURITY COUNCIL RESOLUTION 2124 ADOPTED ON 12TH NOVEMBER 2013 REGARDING ENHANCING THE MILITARY CAPACITY OF THE AMISOM AND THE SOMALI NATIONAL FORCES AND CALLED FOR THE REVIEW OF THE RESOURCE PACKAGE TO ASCERTAIN ITS ADEQUACY TO FACILITATE CONTINUITY AND STRENGTHENING OF THE MILITARY CAMPAIGN AGAINST AL-SHABAAB. 21.THE SUMMIT REITERATED ITS CONTINUED SUPPORT FOR THE GOVERNMENT OF SOMALIA AND CALLED UPON REGIONAL BODIES AND THE INTERNATIONAL COMMUNITY TO COME FORWARD AND SUPPORT ECONOMIC, SOCIAL AND POLITICAL INTERVENTIONS GEARED TOWARDS ENHANCING THE CAPACITY OF THE SOMALI GOVERNMENT AND ITS GOVERNANCE INSTITUTIONS TO FULFIL ITS MANDATE AND MEET THE EXPECTATIONS OF ITS CITIZENS. 22. THE SUMMIT REAFFIRMED THEIR SUPPORT FOR THE EFFORT OF THE ICGLR/SADC MEMBER STATES AND THE INTERNATIONAL COMMUNITY ON THE ONGOING PEACE INITIATIVES AIMED AT STABILIZING EASTERN DRC, AND IN THAT REGARD, ENCOURAGED THE EAC PARTNER STATES TO SUPPORT THE ONGOING POLITICAL PROCESS (KAMPALA DIALOGUE), WHICH SHOULD BE CONCLUDED AS SOON AS POSSIBLE. 23.THE SUMMIT NOTED THE JUSTIFIABLE CAUSE FOR THE NEED TO HARMONISE THE TERMS AND CONDITIONS OF SERVICE FOR THE ELECTED MEMBERS OF THE EAST AFRICAN LEGISLATIVE ASSEMBLY WITH THOSE OF ALMOST EQUAL STATUS WITHIN THE COMMUNITY. THE SUMMIT APPROVED A LUMPSUM INCREMENT OF USD 1,206 PER MEMBER WITH EFFECT FROM 1ST JULY 2014. 24.THE SUMMIT COMMENDED THE INITIATIVE BY THE MEDIA IN THE REGION TO FORM A BODY THAT WILL REPRESENT THEIR INTEREST AND PLAY A MORE ROBUST ROLE IN PROPAGATING THE INTEGRATION ISSUES. 25.THE SUMMIT DIRECTED THE COUNCIL OF MINISTERS TO STUDY THE MODALITIES OF INCLUDING FRENCH AS A LANGUAGE OF THE COMMUNITY IN ADDITION TO ENGLISH AND KISWAHILI. 26.THEIR EXCELLENCIES, PRESIDENT PAUL KAGAME OF THE REPUBLIC OF RWANDA, PRESIDENT, UHURU KENYATTA OF THE REPUBLIC OF KENYA, PRESIDENT JAKAYA MRISHO KIKWETE OF THE UNITED REPUBLIC OF TANZANIA, AND PRESIDENT PIERRE NKURUNZIZA OF THE REPUBLIC OF BURUNDI THANKED THEIR HOST, HIS EXCELLENCY PRESIDENT YOWERI KAGUTA MUSEVENI OF THE REPUBLIC OF UGANDA, FOR THE WARM AND CORDIAL HOSPITALITY EXTENDED TO THEM AND THEIR RESPECTIVE DELEGATIONS DURING THEIR STAY IN UGANDA.